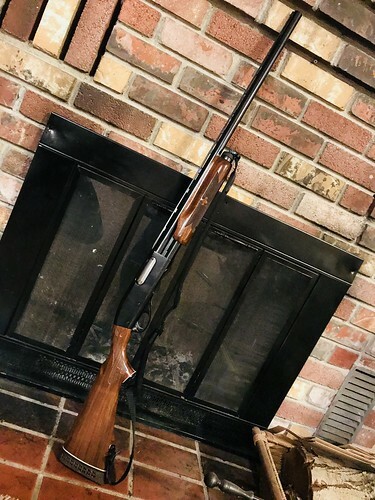 Here's the 1970's Wingmaster I picked up from RK1911 this summer, It was a fixed full choke 30" barrel, so I picked up a new remchoke 28" barrel to take afield this bird season. Still havent gotten out yet....oof. The thing looked brand new inside and out. Hardly even a handling mark, and I believe he gave me a good deal on it Even with a brand new Barrel I'm in it less than the cost of a low range imported semi auto. Top: Rossi Circuit Judge - I keep it in the corner with 5 shells of 5 pellet 000 buck. Can also shoot .45 colt. Bottom: Maverik 88 18"bbl + shockwave raptor grip- 12 gauge, rides shotgun sometimes when I drive to California. Couple of 870s that got cerakoted by Nevada Cerakote in Minden. Magpul OD green and custom color mixture of bronze, black and silver. Way back when, I did some 870's.. The reliability of pump guns is the best but I prefer an automatic. My Browning A5 which belonged to my father and is smooth as glass after 40 years of Missouri bobwhite quail hunting, but attesting to John Browning's genius it shows absolutely zero wear on the internals. Added an 8-shot extension tube and Hastings 24" slug barrel with cyl bore screw-in choke, never had a malfunction even on rapid fire. I have a composite stock and fore piece but prefer the wood. Balance with eight 2 3/4" shells is excellent as the end of the fore piece is just about in the center of the loaded tube, just the right amount of weight up front. My new favorite combat shotgun, my Standard Manufacturing DP-12.